Nintendo's premiere fighting game series packs the same punch in the smaller form-factor of the Nintendo 3DS. In 1999, Nintendo released the first game in a brand new franchise for their Nintendo 64 console. They were taking some of their most well-known characters like Mario, Luigi, Donkey Kong, Samus, and Star Fox, and throwing them all into a big, massive fighting game. That first offering was Super Smash Bros., developed by HAL Laboratories, and it became one of the biggest games in the history of one of Nintendo’s most popular consoles. 15 years later, Super Smash Bros., or simply Smash, is one of Nintendo’s absolutely biggest and most defining franchises, shepherded by its original creator: superstar game developer Masahiro Sakurai of Sora, Ltd. Its dominance is only outdone by its solid and atypical fighting game mechanics, and because it has featured so many of Nintendo’s great characters (including some notable guest characters from other companies and franchises), it has ascended to one of the absolute heaviest hitters in Nintendo’s repertoire, and the hype and excitement for the latest iteration of the series has definitely reached a fever pitch. Much of that excitement comes from the fact that this time, Smash is being released on two fronts: the console market, and now, for the first time ever, the handheld. The latter of those two is the first to see release, so let’s take a critical look at Super Smash Bros. for Nintendo 3DS, one of two (!) Smash games arriving from Nintendo this year. The very nature of the 3DS’ social features allow the ability to play Smash with anyone around you who has a game card and a 3DS system, in addition to smooth online functionality. The mere concept of taking Super Smash Bros. wherever you want to go should prove too good to pass up for anyone that has enjoyed the series over the years. While Nintendo is staying out of licensing their games to the increasingly dominant smartphone gaming market, they’ve managed to do surprisingly well with their latest handheld console, the Nintendo 3DS. Releasing in 2011, well after iOS and Android cemented their dominance for on-the-go working and playing, the 3DS is certainly the most popular gaming handheld of this generation, outselling Sony’s PlayStation Vita by a factor of five (45 million 3DS’ to 9 million Vitas). Still, though, fans were surprised to learn that Super Smash Bros., which we had always assumed would see a Wii U release, would also be released on the handheld format. One of the coolest elements of this is that the games are supposed to be companions to each other, meaning that the 3DS and Wii U versions will have identical character rosters and connectivity abilities, allowing some kind of progress to be transferred between the two games. It’s incredibly cool to be able to play Smash while riding the train, waiting for laundry to finish, or even waiting in line at the DMV. In addition to the convenience of having portable Smash also comes a plethora of new online functions in this version of the game. Using the 3DS “StreetPass” feature, you can exchange data with another Smash player while the system is in sleep mode and engage that data in a game next time you turn it on. Multiplayer has always been a major component of Smash, and the 3DS version allows several ways to fight against other players from around the world. If you’re connected to a Wi-Fi network, you can connect to the internet and play against others from across the globe. It’s incredibly easy to jump into a game with a player on your Nintendo Network friends list, as well. Because of the great communicative features of the 3DS with other handhelds like it, you can also engage against players locally. Imagine sitting on a train or bus, and you pull out your 3DS to play a little Smash, and your handheld then detects another Smash player sitting just a few rows from you. You can face off against them, too. Other connectivity features, particularly the cross-platform ones, will have to be seen when the Wii U version is released next month. Still, though, this is proving to be a quite an interesting evolution of the Smash franchise. So…how is it? 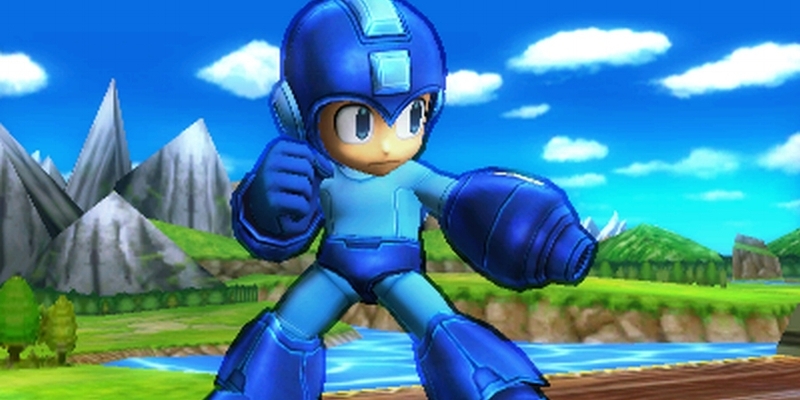 Super Smash Bros. for Nintendo 3DS includes some surprise guest characters, like Capcom’s Mega Man, as well as Pac-Man as part of the record 48-character roster. One of the concessions that we have to make by transitioning to a handheld console is, of course, graphical power. The 3DS isn’t an HD-capable console, but of course, it has no need to be! That being said, the game is actually pretty graphically impressive, with some clever additions to the visuals to make everything easy to see on the smaller screen. Each character has a black outline around them (which can be toggled on or off in system settings), and the stereoscopic 3D effects actually work very well in the game, much to my initial surprise. It’s especially cool when a character is eliminated and slams against the front of the screen, which looks fantastic in 3D. Beyond that, the game seems to run natively at 60fps, which is pretty surprising for a handheld. 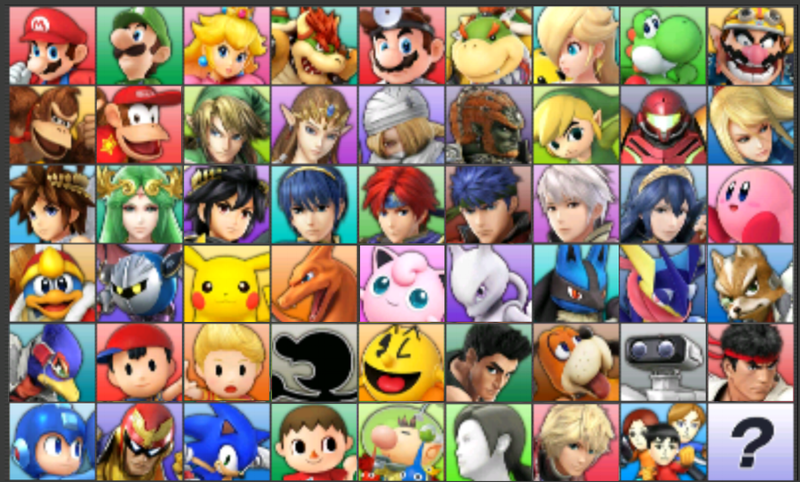 It boasts a total of 48 playable characters, by far the most in any Smash game. These include the usual suspects like Mario, Samus, Fox, Link, Pikachu, and Captain Falcon, to others like Olimar (from Pikmin), Little Mac (from Punch Out! ), Sonic the Hedgehog and new surprises like Pac-Man and Mega Man. The roster is very impressive, and chances are that you could find yourself playing just so you can unlock the complete playable roster. Single player game modes exclusive to the 3DS version include “Smash Run,” which replaces the “Adventure Mode” from 2001’s Super Smash Bros. Melee and “Subspace Emissary” from 2008’s Super Smash Bros. Brawl. In “Smash Run,” you have five minutes to explore a floating island for power boosts that impact your jumping distance, strength, defense, and several others. After exploring the island, you’re quickly thrown into a final boss battle that only has a 1-minute time limit. Collecting as many boosts as possible during your 5-minute exploration is crucial, since you’ll likely need a fair amount of boosts in order to dispatch the final boss. While exploring, though, there are a large number of enemies who will try to take you out. If they manage to, you may go into the final fight with too many handicaps to overcome. The Wii U version will not feature “Smash Run,” so we’ll have to wait until that game releases to see what the single player offerings will be on the console version. Beyond that come the typical game modes: up to four players are supported in either online play or local play, and it’s easy enough to train with CPU players at varying degrees of difficulty. The fighting mechanics and basic goals for Smash are unique in comparison to other popular fighting games like Street Fighter or Mortal Kombat. Smash operates a bit differently by assigning each fighter a damage percentage that begins at 0%. Over the course of a fight, taking more and more damage will get you closer to elimination. If you manage to avoid being taken out and your damage gets up above 200%, for instance, less powerful hits from your enemies could devastate you, throwing you great distances across the map. If you fall off the edges, you’re eliminated. A look at the full roster of Super Smash Bros. for Nintendo 3DS, with such mainstays as Mario, Kirby, Fox, and Samus, and newcomers like Mega Man, Pac-Man, Duck Hunt Dog, and Wii Fit Trainer. There is a negative trade-off with this iteration of the game, though, and that’s the controls. Although the controls are surprisingly broad, extended sessions of play on the 3DS using the face buttons and the circle pad is a cramp waiting to happen. This isn’t necessarily the fault of the game insofar as the design of the hardware, but the very nature of the gameplay makes longer sessions pretty difficult. More vigorous players have also reported instances of destroying their circle pads as a result of the intensity that’s easy to fall into when playing a nuanced and detail-oriented fighting experience like Smash. One place that the game deserves criticism in this regard, though, is in isolating movement controls to the circle pad instead of allowing them to be mapped to the directional pad. It’s hard to say if it would make a major difference in the overall scheme of some of the problems, and there’s nothing to say that we wouldn’t begin to see reports of peoples’ d-pads being broken as well, but it would’ve been nice to have the choice, especially if people come from playing on a console controller with the d-pad. While some other players have complained about latency issues in online game modes, I have had virtually no issues. Game lag seems surprisingly minimal, and is already a vast improvement over the very laggy online multiplayer mode on Wii’s Smash Bros. Brawl. Overall, I’m very happy with the online mode for the 3DS iteration of the game, and I was legitimately shocked at how well it played when I jumped into my first online match. Given the physical limitations of the hardware, Smash on 3DS feels like a true successor to the Smash Bros. throne, and a great game in and of itself. It’s far more than a simple preview of the upcoming Wii U game, and really does feel like it stands in equal measure with the other console-based entries in the series. As a huge fan of this series, I’m thrilled at the fact that I can now take it with me wherever I go…though I may try and take it easy on the circle pad.